The hardest part in replacing the laminate countertop is the cutting. Not all are aware of what to do and how to do it properly. I should know, I have experienced the hardship of cutting our laminate. And because of this, I have decided to write this how to cut laminate countertop guide to help those who are on the same ordeal. Let’s start this guide by telling you some important facts about laminate. What is a Laminate Countertop? A laminate countertop is made from layers of plastic bonded together into kraft paper or particleboard to make a durable countertop surface. Countertops are available in various patterns, colors, and textures. You can choose the one that mimics the looks of a marble or one that mirror the appearance of stainless steel. The result is a clean and smooth surface that won’t cost you that much. A laminate countertop is lightweight in nature, unlike heavy stone countertops. Installing laminate is easy and you don’t need to ask for professional help. And because of this, it is cost-efficient and you don’t have to spend a lot on this. Since it is not as durable as marble or Corian, you need to replace it more often to keep the surfaces look good. However, with proper care, it can last longer. Never use the laminate counter as cutting boards since they can easily scratch. If possible, avoid placing hot items on it directly to prevent damage. Use mild soap in cleaning the laminate surface. You can purchase laminate countertops in standard sizes available in 2-foot intervals from four to twelve feet. There is a possibility that the size of your counter is not divisible by two. Do not worry, you can cut the laminate, so it will fit perfectly. In fact, the retailer will have end trim pieces that will match laminate to glue on after making a cut. Here are the steps on how to cut laminate countertops. 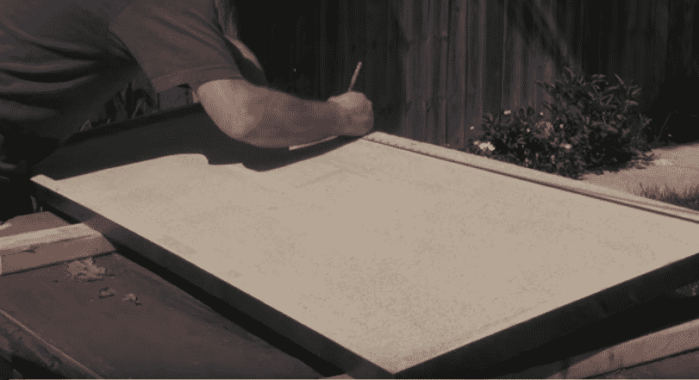 You may find the steps somewhat similar on how to cut formica. Measure the length of the countertop at different points using a tape measure. The countertop proportion is the best measurement you can use for the laminate. Make sure you add one inch on all sides to extend over the edge. Use a pencil in marking the cutting line on the laminate. To help you create deep marks on the laminate, place the carbide-tipped scoring tool trace over the cutting line use metal carpenter’s square as your guide. You can use a handheld saw or an electric saw to cut the laminate. To minimize or avoid chipping, place the laminate face down and cut from the back of the sheet. It is best you create a guide or jig to make sure you will have a straight cut. To make this, place the laminate on a working table using the offcut draping on the corner and fasten a straight type of wood on the table. Make sure it is offset from the cut line a distance equivalent to that between the edge of the saw foot and the blade’s edge. Tip: add a 1/16th inch on all sides so the cut will be a bit wider. This is done to resolve in case of the minor chip into the laminate. You can cut it out using a belt sander and the laminate will remain at its correct size. Find the best super glue to make sure the laminate will stick on the base for life. Before spreading the glue on the countertop and on laminate make sure to clean the surfaces well. Since glue is a potent chemical use an organic vapor respirator, turn the exhaust fan, and open the windows. Let the glue dries up a bit before placing the laminate. From the excess laminate you added during measurement, cut a one-inch overhand with the use of a trimmer. Roll the trimmer on the edges of the countertop back and forth. 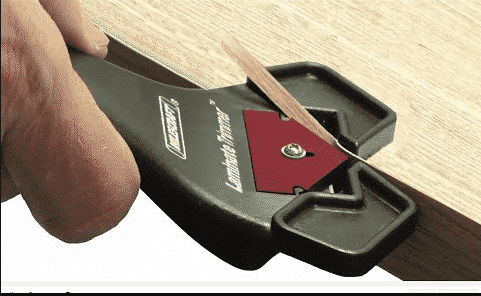 To ensure accurate trimming, roll the trimmer on the laminate and the base should be flat. Another option to cut the laminate is by using a circular saw. The blade must have 40 teeth to create a clean finish on the edges. Position the blade on the thickest part of the countertop then start sawing in a steady motion. 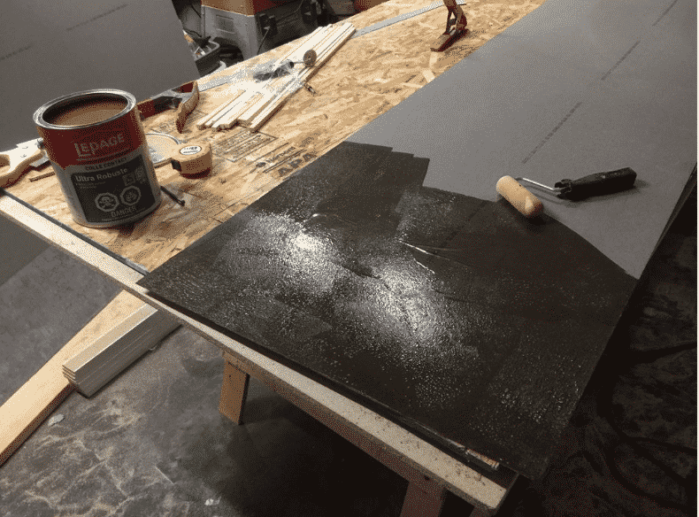 Sanding is the final step in cutting laminate countertop. It will provide a smooth finish. To remove the rough surface of the laminated countertop it should be filed. You can use a moderately rough metal file to create a smooth finish. Make sure to file in a downward direction. This will keep the countertop protected from lifting. Some edges should be smoothened with the use of a fine grit sandpaper. It should be done on the cut edges of the laminate. After sanding and filing the laminated countertop, don’t forget to clean the renovated area. Use a soft cloth, dab it with mild polish cleaner and then wipe the laminated area. It is important that the countertop surfaces are free from any stain or dirt. To make sure stains will not stick and can be removed easily. Do not forget to wear safety gears when working. Put on your working gloves and safety glasses when cutting laminate countertops to keep your eyes and skin protected. If you need to cut the laminate sheet from the front using a power saw, you can prevent chipping by placing masking tape on the cutline. Cut through the tape and remove it after you are done. 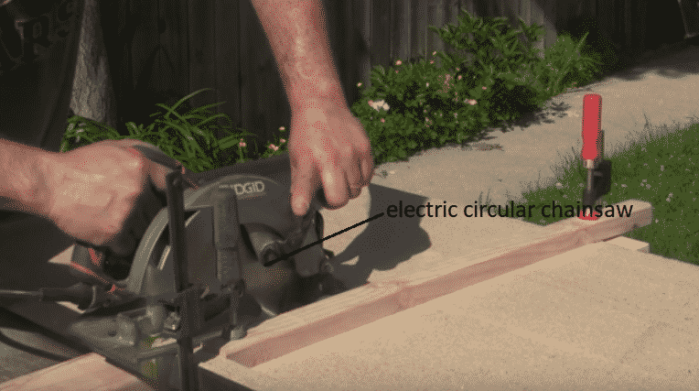 You can also use a plywood-cutting blade with bigger teeth. If you keep everything in mind, you will not have any problem completing the task. I hope this how to cut laminate countertops guide helps you in completing the job successfully. It may sound difficult at first, but if you follow the steps above you will be surprised how fast and easy it is without getting into trouble. If you find this article helpful to you, feel free to share it with others or you can comment below.